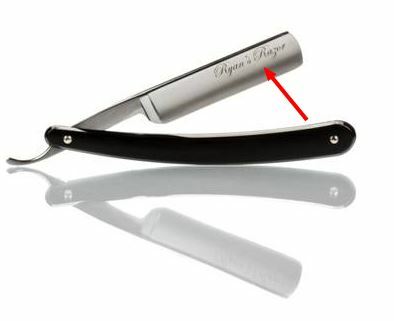 Add a classic, personal, or custom touch to your razor! Just select the text and font type, and we'll laser-etch it into your razor. Etching is done as seen on the pictures of Ryans Razor. Etching will be located on the top half of the blade face and toward the toe of the razor. Etiching will on the left face of the razor unless the razor has factory art/etching then it will be on the opposite side. Please refer to diagram below. After Purchasing this service, send in your razor, along with your name, and order number from this order. You can enter a note in the order, or with the razor about where on the blade you would like the etching to be done.